Ald. 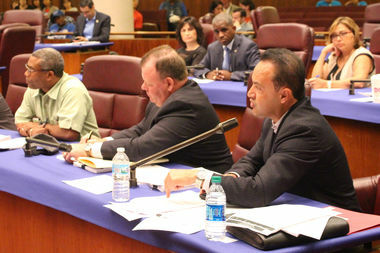 George Cardenas (right) faced off against Ald. Walter Burnett Jr. (left) over redistributing TIF funds to CPS. CITY HALL — Aldermen clashed Friday over a proposal to redistribute funds earmarked for economic development to Chicago Public Schools. There was no vote and no action taken in the Finance Committee subject-matter hearing, but there were plenty of fireworks as some aldermen insisted on making students the city's "No. 1 priority," while others defended their Tax Increment Finance district funds. "Our school district has been battling for survival," said Ald. George Cardenas (12th), lead sponsor of the Chicago Public Education Revitalization Ordinance. He said it "takes a precedent from last year" — when the city declared a surplus of $113 million in TIF funds and redistributed it, with about half going to CPS — and codifies it to make it an annual event in years when CPS is declared to be in "distress." Ald. 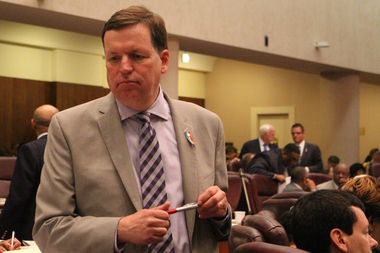 Joe Moore dismissed the TIF proposal as "a quick-fix solution to play to the crowd." In that case, any TIF funds not already committed to projects that had gone through the City Council would be declared in surplus and redistributed, Cardenas said, and the city would basically donate its 20 percent share to CPS as well. "We have to reset these priorities and invest in schools," Cardenas said. "This ordinance does that." Yet Budget Director Alexandra Holt advocated a more freeform "year-by-year" approach, as with the $113 million TIF surplus declared last year. When she testified that Cardenas' proposal would rule out many projects that do not come before the Council — including road improvements, streetscapes and libraries — that riled Ald. Walter Burnett Jr. (27th), who withdrew his support for the measure. "We're trying to do economic redevelopment," Burnett said, citing how his ward was still recovering from vacant properties left behind by the Cabrini-Green and Henry Horner housing projects. "I cannot hinder that redevelopment." Ald. Anthony Beale (9th) agreed, pointing to how TIF funds were critical to the revival of Pullman and Roseland. "TIF is a very important part of what we're trying to do with my community," he added. "We know our schools are in trouble. But you cannot throw the baby out with the bath water." "The motivation behind this is very understandable," said Ald. Joe Moore (49th). Yet he dismissed what he called "this so-called solution to our school funding problem," calling it "a quick-fix solution to play to the crowd." Ald. Scott Waguespack (32nd) knocked critics of the proposal for "fear mongering," and others argued forcibly for giving CPS any source of relief available. "CPS is not doing well now, and we have to acknowledged that," said Ald. Harry Osterman (48th). "This comes down to priorities. "Streetscapes can wait," he added. "Here's what can't wait — second grade, kindergarten, librarians and special-education teachers. "I think it's important that this ordinance goes through," Osterman said. "CPS needs the money now." "It's about priorities," said Ald. Carlos Ramirez-Rosa (35th). "The No. 1 priority for our city should always be our children." Ramirez-Rosa and Waguespack said the ordinance could potentially redefine allowable TIF projects as anything an alderman had taken to the Department of Planning and Development. Yet Beale accused them of wanting to have it both ways, to spend the money on education and development, saying, "We're talking out both sides of our neck here." The Chicago Teachers Union's Matthew Luskin said the debate was being bogged down on TIF policy. "This isn't a blanket shutdown of the TIF ordinance," he said. "This is a proposal that says when there's a crisis, let's respond." Marc Kaplan, a Local School Council member at Uplift High School in Uptown who was also one of the Dyett High School hunger strikers, bemoaned how many CPS parents who attended the meeting had to leave to pick up children from school before they had a chance to testify. Members of grassroots groups the Brighton Park Neighborhood Council and Action Now, among others, packed the City Council gallery at the beginning of the meeting, but it dragged on through an extended debate on minority hiring in the Aviation Department over O'Hare Airport bond deals, and it was afternoon before Cardenas' ordinance was even taken up. By the time Kaplan had a chance to testify, only a handful of people remained in the audience. The meeting was recessed until 2 p.m. Monday, when a substitute ordinance or the original could be submitted for a vote.